Within the DRM research framework, explorative design case studies, systematic literature reviews, expert interviews, observation case studies, and experimentation research methods were employed, in order to develop design guidelines, high performance space types and case studies, as well as assessments of the hypotheses of several experiments. 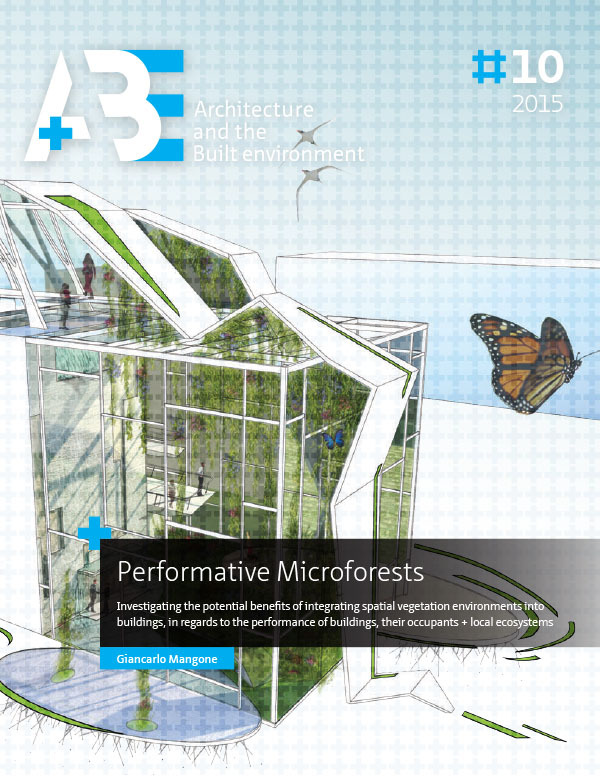 For instance, as part of the investigation of the first sub research question, a design case study was conducted that evaluated the potential of microforests to reduce the energy consumption rates of office buildings, both in terms of the potential of vegetation to function as a shading device, and in terms of the potential energy savings that can be attained through the provision of semi-outdoor, high quality microforest workspaces. The results of this study, which are discussed in Chapter 4, indicate that vegetation can be as effective, or more effective, than typical shading devices, in terms of shading effectiveness. Moreover, in terms of economic performance, this study found that improving occupant work performance provided substantially greater economic benefits than reducing the energy costs of the mid-size commercial office building. This finding indicates that, in terms of economic performance, design teams should be focused on designing office environments that improve worker performance. Thus, the results of this case study indicate that economic and worker performance are interrelated. In order to investigate the potential effects of microforests on occupant thermal comfort, a quasi-experiment which evaluated the potential psychological and physiological impacts of microforests on occupant thermal comfort, was conducted. This study is discussed in Chapter 5. The results of this study indicate that working within a densely vegetated work environment, such as a microforest, improves occupant thermal comfort, both in normal and more extreme temperatures, throughout the four seasons. Thus, the inhabitation of microforests can improve occupant thermal comfort, as well as reduce building energy consumption rates, by allowing the temperature set point of the space to be raised in the summer and lowered in the winter. In terms of microforests impacting worker performance, a multidisciplinary, systematic literature review was conducted to identify the potential of the design of work environments to impact worker performance, particularly natural environments such as microforests. The results of this review, which are discussed in Chapter 6, indicate that natural environments can provide a diverse range of worker performance benefits. However, further research is necessary to determine the effectiveness of various design solutions, space types, and space qualities on worker performance. To this end, a survey was conducted to evaluate the types of work environments and space qualities that promote worker performance, including constructed and natural environments, in terms of a diverse range of work tasks. The results of this study, which are described in Chapter 7, suggest that knowledge workers prefer to conduct a wider variety of work tasks in microforests, compared to a range of existing work space types, than existing research suggests. Moreover, the results of this study suggest that different types of microforests, such as spatially open and public microforests compared to more dense and private microforests, provide different performance benefits, and are preferred for different work tasks. Hence, these findings suggest that the integration of microforests into office buildings can improve worker performance, and from a more general perspective, that workers prefer to have access to more diverse types of work spaces within their office environment than typical office environments provide. Furthermore, the results of the conducted studies indicate that the design of work space environments, at both the scale of individual spaces and space qualities, impacts worker performance, and thereby should be accounted for in the design of office environments. In terms of microforests impacting the ecological performance of building projects, a systematic literature review was conducted to investigate the ecological performance potential of building projects. The results of this review are presented in Chapters 8-11. Three general design strategies to improve the ecological integrity of local ecosystems were identified: design for ecosystem functions, design for ecological behavior, and design for biodiversity. The potential effectiveness of various design strategies within these three general design strategies were explored, as well as gaps in existing research, and issues with evaluating the ecological performance of building projects. Potentially effective design solutions were identified, such as hybrid infrastructure, gene seed banks, and constructed environments which are designed to foster positive experiences in natural environments. Moreover, the results of this review indicate that further research is needed to evaluate the comparative value of different ecological design solutions, as well as effective means to account for the interrelationships of building projects with their local and regional contexts. Taken together, the results of this research project make it evident that the design of constructed environments has a significant impact on the performance and value of building projects, from economic, social, and ecological performance perspectives. More specifically, the integration of microforests into office environments was found to yield a diverse range of building, worker, and ecological performance benefits. The results of this research project can aid in the development of comprehensive design support systems and building project performance metric systems, as well as identify, and in some cases evaluate, potentially high performing, innovative design solutions and strategies. However, it is important to note that the results of this research project indicate that, in order to develop comprehensive building performance evaluation metric systems and design methods, further research is necessary. To this end, this research project identified innovative performance benefits that the design of building projects, and microforests, can provide, as well as identified existing research gaps that should be addressed. This research project also identified potentially high performing space types and design strategies, including various types of microforests. In summary, the results of this research project demonstrate that the design of building projects can be an effective and efficient method to generate diverse economic, social, and ecological performance benefits. Moreover, the results of this research project suggest that the design of high quality spaces, particularly microforests, can improve the social and ecological performance of building projects, while at the same time, also reduce building costs.